Today Ben and I took Mom, Dad and Aida to the new apartment. They were very impressed and seemed to really like the area and the apartment itself. Aida seemed pretty happy too. There are lots of windows for her to look out. So even though we didn't stay with the apartment with the balcony (it was smaller and more expensive), there is a lot more room for Aida (and us) and since the windows are pretty low Aida is able to look out. All around everybody is happy. Aida was ridin' in the back seat with her grandma and grandpa on the way to the new apartment. Our apartment is on the corner of Brandeis Terrace and Boston Terrace. 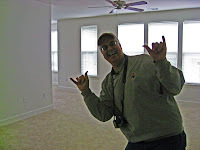 Here's Dad enjoying our new living room. This is our new dining room. Aida enjoyed her first dog park experience. We took her to "Bow Wow Beach" in Stow with "grandma" and "grandpa." As soon as we got there she took off straight into the water, no hesitations. She spent the afternoon swimming, drinking the lake water, and chasing and being chased by the other dogs. Aida gives grandpa a snakey lick on the face on the way to the park. As Aida would run through the water, Baywatch style, she kept scooping up water in her mouth. It's amazing she didn't get sick! After running through the water, she had to shake it all off. Of course it was usually as close to you as she could get, thus getting us all wet! Grandma and Grandpa watch from the bench as Aida runs by. One of Aida's favorite things is to be chased and Ben is really good at it! Ben and I went to get pumpkins from a farm about an hour away. My pumpkin is the cute small one and Ben's pumpkin is the big, manly, pumpkin. We carved the pumpkins a few days later and they lasted all of about 5 days before they started to mold. The weather here has been so warm it actually is cooler inside than out. So we attempted to put the pumpkins by the air conditioning vent so that they would stay cool. However, due to the previously mentioned mold, they did not stay cool enough. So although the pumpkins didn't last at least we got to carve our first pumpkins as a married couple :) I know corny, but I though it was sweet. I am going to attempt, yet again, to keep this blog updated. Not sure that it will last and based on my previous record...it won't. But who knows, it may stick this time! So here goes nothing, enjoy it while it lasts!